Contains water-soluble complex with physiological proportion of essential vitamins. 1 ml of Volstar contains vitamin А - 50,000 IU, vitamin D3 - 2000 IU, vitamin Е - 30 mg and vitamin С - 100 mg (as active ingredients) and excipients. 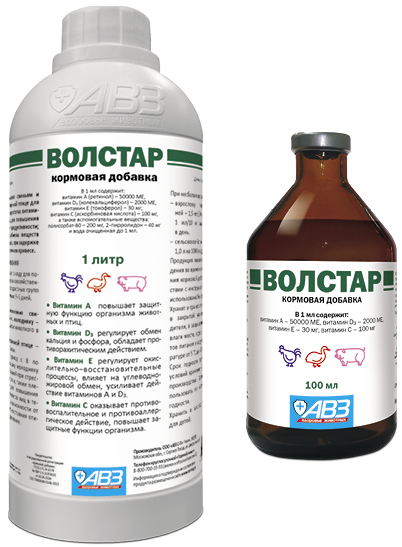 Volstar supplies vitamin deficiency in poultry and pigs, has combined effect on productivity improvement (intensive animal and poultry production) and increases protective organism functions. Vitamin A regulates function and regeneration of epithelial tissues increasing infection resistance. Vitamin D3 regulates calcium and phosphorus metabolism, influences on their absorption in gastrointestinal tract and provides antirachitic effect. Vitamin E regulates oxidation-reduction processes, influences on carbohydrate and fat metabolism and enhances action of A and D3 vitamins. Vitamin C is an important factor of normal growth increasing protective organism functions. Use Volstar in pigs and poultry to normalize metabolism in stress conditions, delayed growth and insufficient gain in weight; to increase viability and productivity; to prevent and treat hypovitaminosis; as a part of combined therapy in infectious and invasion diseases. Pigs and poultry of all ages: add to drinking water every day within 3-5 days. Due to inadequate ration, doses are increased: pigs - 1.5 ml/50 kg and 1 ml/10 kg, respectively; poultry - 1.0 l per 1000 l of water. Animal-based products can be used without restriction during and after Volstar administration. Protect from light and moisture. Store separately from food and animal feeding at 5-25°С. Shelf life is 2 years from manufacturing date when stored in accordance with regulations.